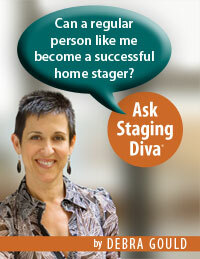 Editors Note: Linda took the Staging Diva Home Staging Business Training Program more than 10 years ago. With this study-from-home program, she was able to complete all the courses while she was on vacation from her full time job. 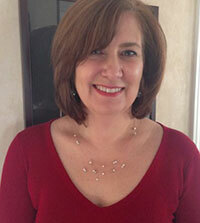 Then Linda took the weekend to put together a home staging portfolio using before and after photos from her own home. She immediately joined the Staging Diva Directory of Home Stagers so she wouldn’t have to figure out how to build her own website. Within 30 days of ordering the Staging Diva Home Staging Business Training Program, Linda had her first paying client and earned enough to make back her entire investment in her training and her one year web listing in the Staging Diva Directory. > Read how you can put together your own home staging portfolio in a weekend. That’s what so important about what Linda shared about her experience. Staging Diva Grads learn how to charge appropriately for their services from their very first project. That way they don’t get frustrated and burned out before making a great living! If people tell you to work for free or discount your fees, that’s a big clue that they are giving you really bad business advice. Some of it will come from well-meaning people in your life. At other times, you’ll hear this from real estate agents. Even worse, you may get really bad home staging business advice from people offering home staging courses. Anyone can teach a course, it doesn’t mean they necessarily know what they’re talking about. It also doesn’t mean they’ve had any first-hand experience running a successful home staging business. 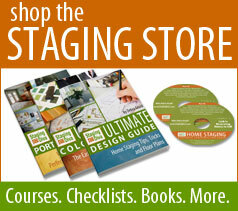 > Here are 15 questions to ask before investing in home staging training.